NASA astronauts successfully sequenced the DNA of microbes found aboard the International Space Station, marking the first time unknown organisms were sequenced and identified entirely in space. 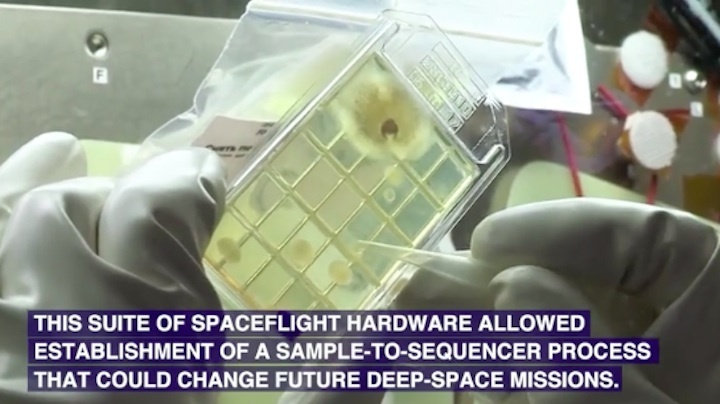 Previously, microbes had to be sent to Earth for analysis, and this new sequencing marks an important step in diagnosing astronaut illnesses and, someday, identifying any DNA-based life found on other planets, NASA officials said in a statement. Researchers back on Earth have now verified the microbe identifications are correct, marking the experiment a success. NASA astronaut Peggy Whitson sequenced unknown DNA found on the International Space Station as part of NASA's Genes in Space-3 investigation. 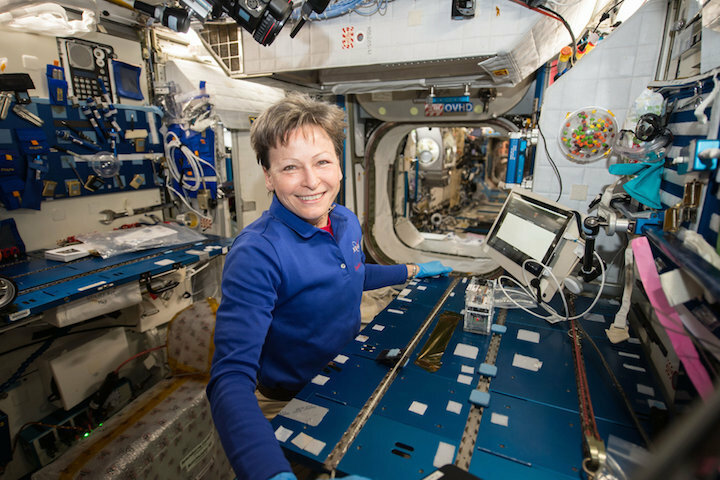 As Whitson led the space station experiment, she was guided by NASA microbiologist Sarah Wallace and her team at Johnson Space Center in Houston. But at a critical time, as Whitson prepared to sequence the DNA, Hurricane Harvey intervened. "We started hearing the reports of Hurricane Harvey the week in between Peggy performing the first part of collecting the sample and gearing up for the actual sequencing," Wallace said in the statement. Ultimately, the Payload Operations Integration Center at NASA's Marshall Space Flight Center in Huntsville, Alabama, helped to connect Whitson and Wallace through Wallace's personal phone, and she guided Whitson to sequence the DNA before sending the data back to Houston. During analysis, "Right away, we saw one microorganism pop up, and then a second one, and they were things that we find all the time on the space station," Wallace said. "The validation of these results would be when we got the sample back to test on Earth." 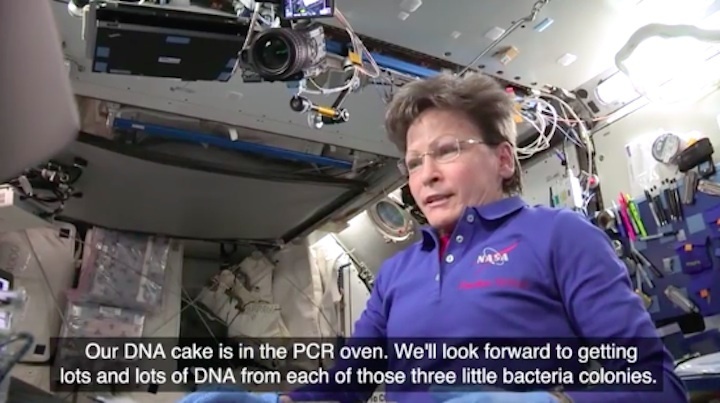 NASA astronaut Peggy Whitson worked within the Microgravity Science Glovebox on the space station to transfer cells from bacterial colonies grown on petri dishes into miniature test tubes. It was the first time the process had been performed in space. Whitson and the samples traveled back to Earth in September 2017, when the next phase of the Genes in Space-3 mission began. Scientists sequenced the microbes again on Earth and verified that each had been identified correctly. Before this experiment, astronauts had amplified DNA for analysis on the space station using a device called the miniPCR thermal cycler, and they had sequenced a DNA sample with the so-called MinION device. But at last, they had successfully combined the two, NASA officials said. "It was a natural collaboration to put these two pieces of technology together, because individually, they're both great," Wallace said, "but together, they enable extremely powerful molecular biology applications."